The beta version of the computer chess engine Rybka (which means “little fish” in Russian) was released in 2005 and it was quickly apparent that it would be a contender as the strongest chess engine in the world. 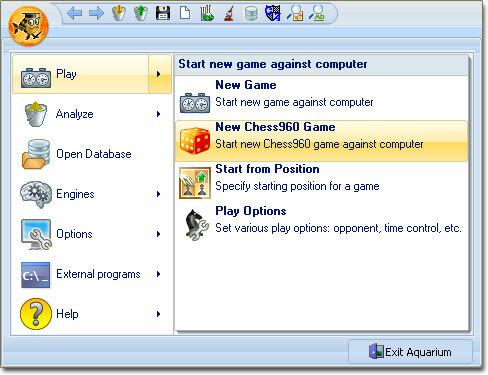 By 2006 it had a rating of 3000, surpassing other engines by as many as 200 points, and in 2007 it became the 15th ICGA World Computer Chess Champion. Since then Rybka has had high-profile odds matches against a number of noted players. It won 4½-1½ against GM Jaan Ehlvest in 2007 and 6-2 against GM Joel Benjamin in a 2008 match in which Benjamin had white in every game and draws were counted as wins for him. Most recently, Rybka, ceding pawn and move in each game, scored 4-4 against GM Roman Dzindzichashvili. Rybka 3 now has an estimated rating of 3150. All that Rybka lacked was an interface to call its own, but now a graphical user interface (GUI) has been designed for Rybka by developers Victor Zakharov and Pete Lupherenko. Rybka Aquarium is designed to take advantage of the full power of Rybka 3. The interface is based on the Fluent design, which was first introduced by Microsoft in Office 2007. The first thing you will notice is that all menus and toolbars have been replaced with a single container that organizes Aquarium’s full feature set into a series of tabs. This container is known as the “Ribbon”. The Ribbon: almost all functions are accessible through the Ribbon. It is divided into tabs that group related functions together. It also automatically displays functions relevant to the task that you are performing. 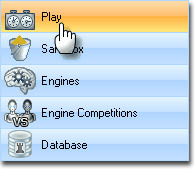 The Navigation Pane: this allows the user to switch between the different modes (such as play, analysis and engine competitions) and provides access to databases, lists and games, etc. The Working Area: this is where you do all your work. You will spend most of your time playing, examining or commenting games, and browsing a list of games, etc. The Working Area: this is where you do all your work. You will spend most of your time playing, examining or commenting games, and browsing a list of games, etc. The developers purposefully geared the Aquarium interface towards serious players, with an emphasis on analysis functionality. There are a many different options such as infinite analysis, blunder check, game analysis, and interactive deep analysis (IDeA). The purpose of IDeA is to dig deeply into a position and return as much information about it as possible. IDeA keeps its analysis in a tree structure that is unlimited in size and which the user can browse at will, even while the analysis is in progress. The tree is used for storing and reviewing analysis and for opening preparation. If you annotate a position in the tree pane, the annotations will be available in each game where the same position occurs, regardless of the move sequence used to reach the position. Rybka also uses persistent hash, which is essentially permanent program memory. This allows the engine to remember its previous analysis. There is also a very interesting feature that is specific to Rybka called the Randomizer. The idea is to allow a user to play many games from a single starting position in order to collect statistics about that position. A randomized Rybka will then keep track of the previous games, so that a match between two randomized Rybkas will systematically explore different variations from the specified starting position. Yet beginning players will also find plenty to keep them busy too. For example, you can play material and rating handicap games, or Chess960, or against other players via the Internet on the Chess Planet server. Nor are you limited to using only the Rybka 3 engine; you can easily use other chess engines in the Aquarium GUI. In addition, Rybka Aquarium supports standard operations such as database handling, playing against the computer (with or without handicaps), hosting engine vs. engine matches and tournaments, and much more. The image above shows the two main Aquarium menu panes. The left pane displays controls for some of the main functions; when the mouse pointer hovers over a control in the left pane, it automatically opens and displays the menu items in the right pane. Play Mode is designed for playing against the computer. Sandbox Mode is designed for viewing and analyzing games that you don’t intend to save. 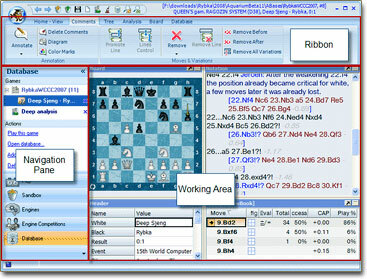 Engines Mode is designed for chess engine management. Engine Competitions Mode is for matches and tournaments between engines. Database Mode is the central mode of Rybka Aquarium. You can open databases, view game lists, individual games, and analyze or annotate them. 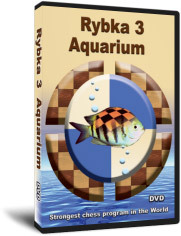 Additionally, Rybka 3 Aquarium comes bundled with a database of 3,300,000 games, an opening book that can be used within the Fritz-family of applications, online access to the Nalimov endgame tablebases (3-6 pieces), and versions for 32 and 64 bit processors. Rybka’s opening book features grandmaster evaluations of more than 100,000 positions, as well as two analysis trees (CAP) containing previously analyzed positions. The Rybka CAP Data contains 20 million positions, while the CAP Data offers 45 million positions analyzed by Rybka and other engines. Thus, Rybka 3 Aquarium offers many powerful tools for game analysis that will benefit serious competitors and many fun features for chess play that will please recreational users. The developers are also very adroit when it comes to adding features that are in demand and it pays to visit the Rybka forum and let them know what features you would like to see in future versions. Furthermore, don’t forget to check out Dadi Jonsson’s ChessOK Cafe columns about Rybka Aquarium in the ChessCafe.com Archives. System requirements: IBM-compatible PC, 256 MB Ram, Hard Disk (4Gb of free disk space), CGA graphics, Windows 2000/XP/Vista, DVD-ROM.